Four women, with little in common except their ties to a Catholic women’s college in Chicago, are called together by Sister Mark, the nun they all adore. Diane is a successful journalist tentatively recovering from an event that shattered her life. June is a skilled carpenter, uncertain how to be feminine enough to find the love she craves. Pat is the earth mother, an optimistic artist and craftswoman who raised seven children on her own after her husband left her. Ruth is a powerhouse CEO, who tells herself that she needs no one, not even the man she once loved and thinks of still. Why has Sister Mark brought these former classmates together? Their alma mater, Shorelake College (a fictional version of Mundelein College) has closed and been taken over by nearby Rockbridge University (a fictional version of Loyola). Sister Mark has asked the women to make plans and raise funds to convert the mansion that was the emotional heart of the campus into a woman’s center. As they struggle to carry out this vaguely defined mission, the four women embark on a journey of discovery—unearthing their own inner truths and finding joy in unlooked-for friendships. 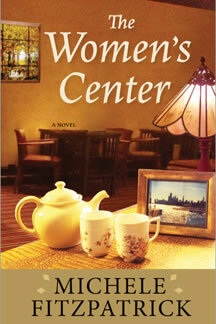 Fitzpatrick portrays the complicated nature of women’s relationships with each other with nuance and insight. And in contrast to many women’s novels, this one gives the male characters their due, portraying them as real and complex people rather than stereotypes to promote the author’s agenda. The vividness of the setting will delight anyone who knows the Windy City, and many readers will relish the clever turns of phrase that sprinkle the narrative. All these details add up to an enjoyable debut novel. Thank you for the excellent review. And yes, I enjoyed the male characters too, to my surprise! Refreshing to read another book where all the characters are real human people.